D=OUT is a great young Visual Kei Band. Although they first started at the end of 2006, they already have a big fan base, their releases frequently selling out in short periods of time. 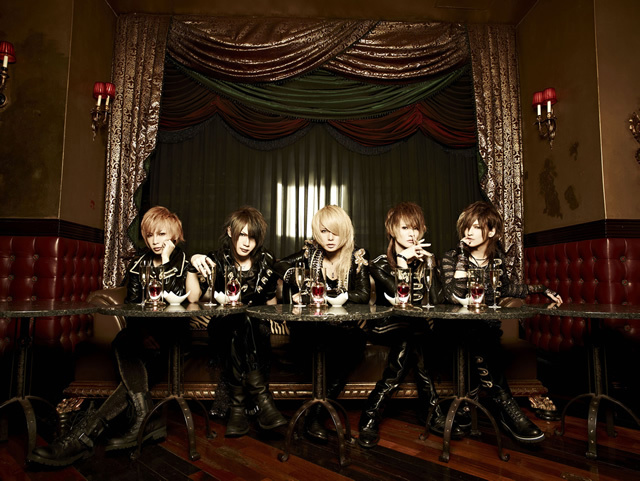 D=OUT began activities in December of 2006. Following Kouki’s former band, Mist of Rouge’s, disbandment in 2003, he teamed up with Ibuki (guitar), Hikaru (guitar), Reika (bass) and Minase (drums) to start a new band. Only five days after the announcement of D=OUT’s formation, the five members played their first concert on December 29th at Holiday Shinjuku with a number of concerts at Ikebukuro Cyber and Holiday Shinjuku after that. Following more concerts in Tokyo their first maxi single, “Heisei Bubble”, hit stores. Released in three versions, the single sold out. Their second maxi single, “Shirohata Sengen”, followed soon after and the band, having become part of the popular Indie Label Speed Disk, released their third single “Bara iro no jinsei”. Now, they work hard on their band concept as “Patriotic Entertainers” and share laughs and tears with their fans!